On July 7th the RV Bold Horizon, using a small Remote Operated Vehicle (ROV), successfully recovered fishing gear and the sub-surface platform the gear was fouled on. 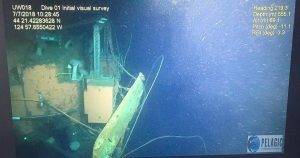 The science platform, part of the Ocean Observatories Initiative, was struck by trawl gear on September 16, 2017, disabling the platform and the shallow-water profiler that was onboard. Pelagic Research Services, which was contracted to recover the platform and gear, found the platform and a trawl door about 38 fms off the bottom in 304 fms of water. OFCC Board member and fisherman Gary Wintersteen assisted with the recovery. Photos courtesy of Gary Wintersteen. More photos and video are available on the OFCC Facebook page.